Dyslexia is most commonly (mis) understood to be confined to letter reversal, word movement on the page and reading difficulties in general. However, dyslexia affects more than reading and can have a wider impact throughout life. Dyslexia is actually the result of a specific visual spatial thinking style called that can be both a gift and a challenge. 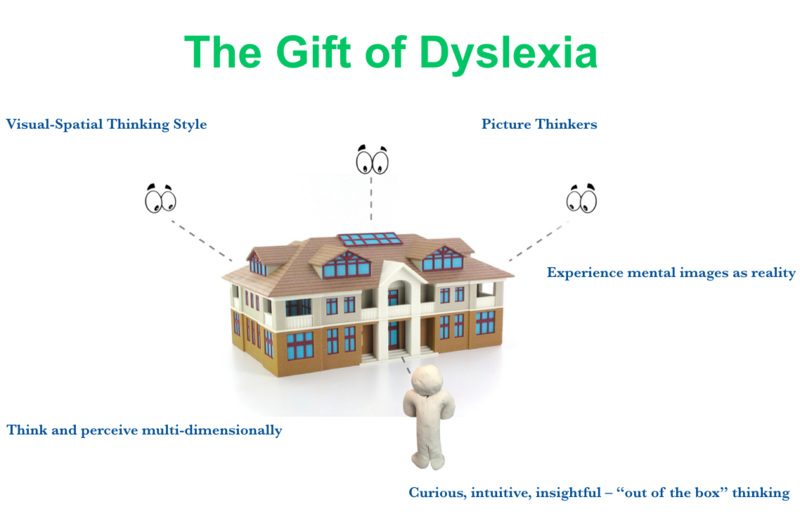 The two dimensional world of symbols, numerals, punctuation and non-picture or connecting words, combined with a thinking style that is primarily non-verbal or visual and a talent for disorientation are at the root of Dyslexia. There are thought to be primarily two kinds of thinking: verbal or sound thinkers and non-verbal or picture thinkers. Dyslexics are primarily visual or picture thinkers, possess a strong perceptual ability and are prone to spontaneous disorientation as a way of reacting to confusion or interest. They have the unique ability to alter their perceptions which can result in the senses of vision, hearing, time, balance and movement being inaccurate. Learning problems arise when there is a lack of control over these spontaneous and subconscious disorientations. The Davis methods address this lack of control with specific mental tools and mastery of symbols and life concepts.